The SanDisk Extreme PRO CompactFlash Memory Card comes with a one-year subscription of RescuePRO® recovery software**. RescuePRO software makes it easy to recover deleted photos or videos and save them to your computer's hard drive--even if the files were deleted months ago. 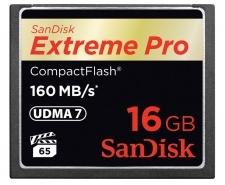 The SanDisk Extreme PRO CompactFlash Memory Card is backed by a lifetime limited warranty**.